First a bit of background: I hooked up my TV to a linux-box running Ubuntu. As a mediaplayer i use XBMC which also has a nice Android app for remote control. Something i miss though, is an easy way to record audio while watching. I use a lot of movie-samples (voices, fx, drones) in my music and i’m always looking at easier ways to get a bunch of samples. 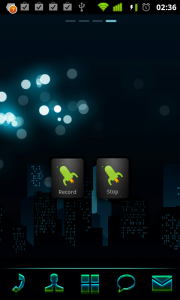 But here comes Remote Launcher to the rescue! This app lets you run custom commands and shellscripts with the click of a button on your phone. Fill in a password twice. You only have to do this once. If you see a message that it’s running on port 4444. You’re set, and you can just CTRL-C again. The important thing is that you now will have a ~/.remotelauncherserver configuration file. Now we need some scripts to start and stop recording. Now we’re ready to configure remotelauncher to use them. Edit ~/.remotelauncherserver and put the following code in there. Make sure to change the paths of the scripts to the correct paths! # for more details and examples. # Blank lines or lines beginning with # are ignored. Once installed you’ll have to add your server and you’re set! The coolest thing about this app is, that you can make a homescreen widget to run 1 of the commands you configured. This makes it super-fast to launch remote scripts from your homescreen! This entry was posted in Uncategorized by Jo Giraerts. Bookmark the permalink. Thanks so much for the detailed install guide.. Saved me alot of time. I dont have /bin/usr/rec, is there a way to install this app?? It’s part of the ‘sox’ package: `apt-get install sox`. Now i’m using pulseaudio and i use ‘parec’ instead.